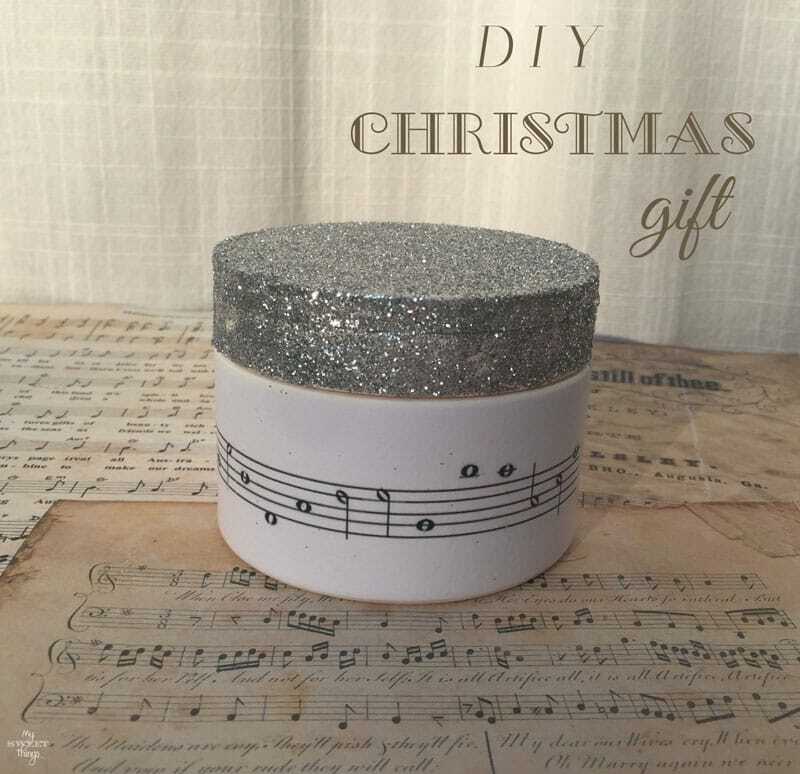 Make your own DIY Christmas Gift using an old container. It will be the perfect Christmas gift as it will add lots of sparkle to any corner and will keep little treasures inside. You know I’m a huge fan of recycling everything that falls into my hands, right? What you might don’t know is that I have two precious daughters with a lovely curly hair. But curly hair is not so lovely when you have to comb it and untangle it! It was a nightmare until we found the solution, and it was applying some hair mask while in the shower. I have lots of empty containers of it, so I just stored them until I had an idea. I painted it with the diy chalk paint so the glue would adhere properly. While it was drying I printed some music paper and cut it to fit. 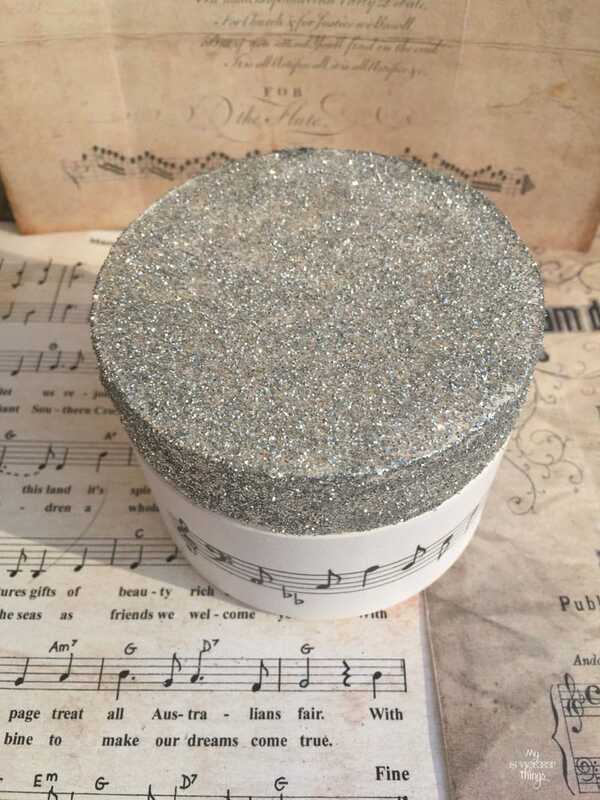 Then I glued it to the bottom part of the container and applied a good amount of glue to the top part and some glitter. I let it dry and then after two coats of spray varnish it was done! It was made in less than an hour… besides looking so cute, it’s great because you can make some in no time. I would love to receive one as a gift, but what about you? Would you like to receive one? This entry was posted in DIY and tagged Before & After, Box, Christmas, Decor, Decoupage, DIY, Recycle. I love sparkly and this is just beautiful! Such a great idea for a unique gift. Thank you Stella, sparkly make everything better! Very nice idea! 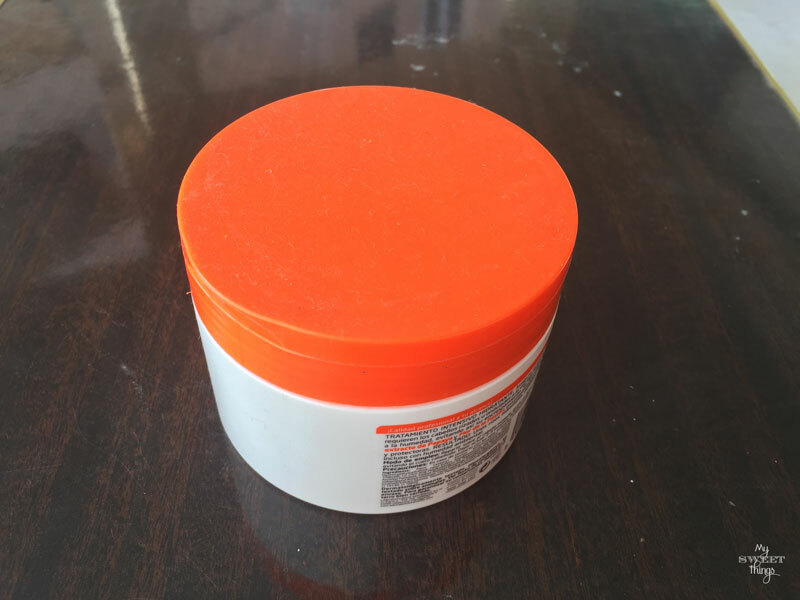 I have so many of those containers, my girls also need mascarillas for their hair and it isn’t even curly….Glitter is always a good idea, right? I think they would be great for bracelets, ear rings and those sort of gifts!!! Love them! Hi, Katrin!! Yes, these mascarillas do wonders!! I can’t imagine a life without them, each bath time would be a battle. And you’re right, that kink of jewelry would fit in perfectly! 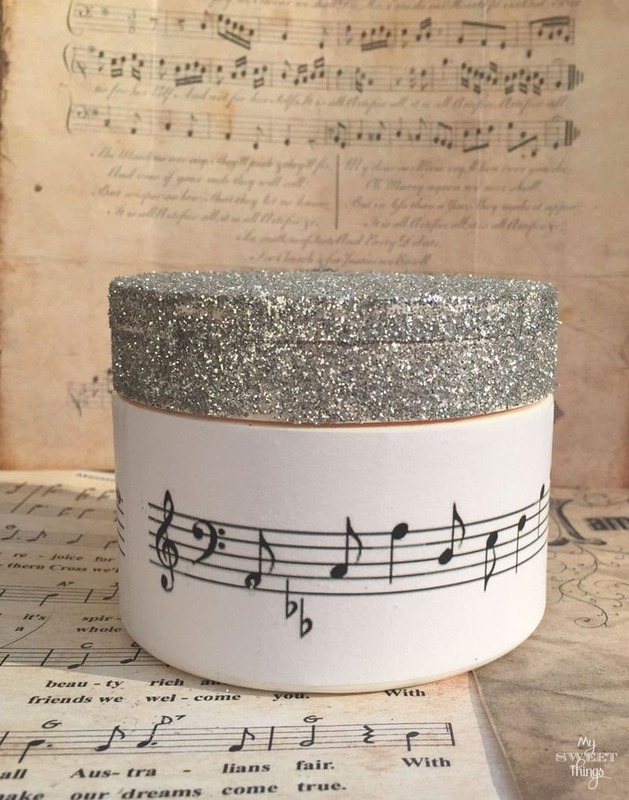 This is a clever idea, I love the music for wrapping. I can imagine other great uses recycling jars. Tanks for sharing. Yes Karren, possibilities are endless when it is about recycling! I do love music sheet no matter where. This is very cool! I always throw these out but now I won’t be! They can also double as decor since they will likely be found on my bathroom counter. Thank you for a neat, easy and beautiful upcycle. Blessings always, Misty. Misty, you are always so kind! Now you can start saving those and make something for your own, there isn’t enough storage in a home. 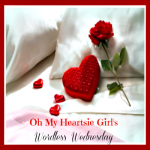 Pingback: The Christmas Link-Up: Recipes! Pili, I have the same exact containers. My daughter has curly hair too, and it is down to her waist. I just love what you have done with it. And I like that you applied chalk paint first. What a smart idea! Thanks for all your inspiration. Merry Christmas to you and yours! Hi, Mary!! Yes, it is better to apply chalk paint first because it makes it easier for the glue to stay, as it becomes a porous surface. You can start saving them too, you’re the queen of up cycling!! Oh my gosh…what a neat idea! SO cute!! I have to perfect person for this on my Christmas list! She will love it! Thanks for the wonderful idea! Hi!! So glad I gave you the idea!! I am sure she will love it! Thanks for stopping by and leave your comments, I really appreciate it! I love the sparkle too! I would love to get one as a gift, it looks amazing! Your idea to add music notes was brilliant. Merry Christmas Pili to you and your family! I know, Ntina, you love sparkle too!! We can’t help it, can we? Being a piano teacher I am sure she would like it. You made the container look so cute! Thanks for sharing this at Cooking and Crafting with J&J. Wishing you a Merry Christmas. I love this idea, especially the glitter on top. Icing on the cake!! Thank you for sharing at Vintage Inspiration Party. Hi Betsy! Glitter adds the extra Christmas look. These are great gifts for kids to use to store their stuff and treasures. Me, I’d use one to store jewelry when I travel. Thanks for sharing your craft at the Over the Moon Link Party. Merry Christmas! Hi, Sandy! My girls are using it to keep their rings, and they want another for the bracelets too. Thanks for the visit, Merry Christmas!! It looks gorgeous Pili! 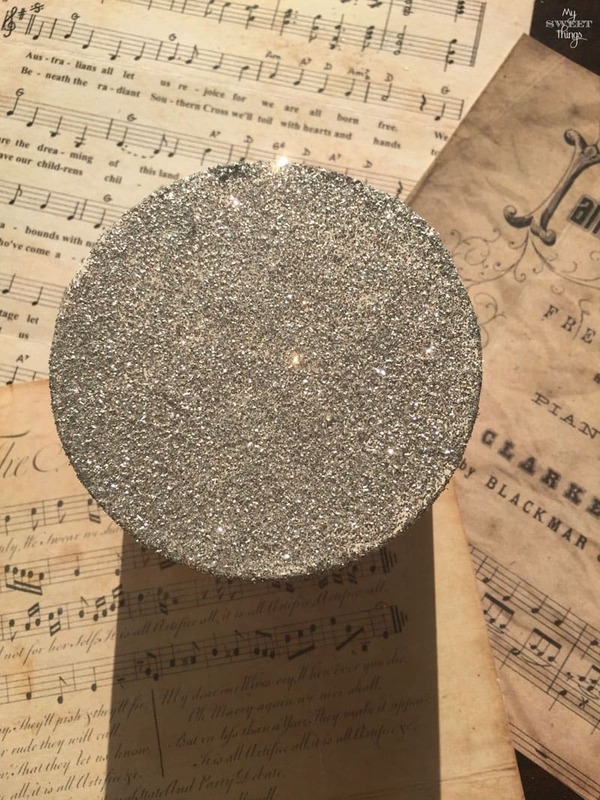 What a great idea for gifts and all this sparkle. I wish you a very Happy New Year full of health and love for you and your family. Kisses! Hi, Christina! Happy New Year for you too! Thank you so much for stopping by, it is always a pleasure to have you here! 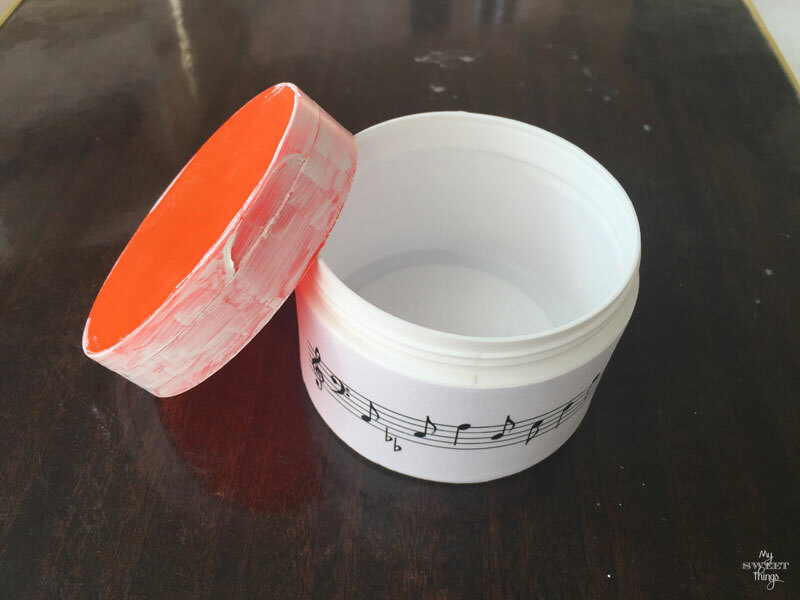 These little tubs look so good once they’ve had a lick of paint, some glitter and some inspiration. Almost too good to give away! I hope you had a wonderful Christmas and New Year Pili. Thank you so much, Sally. I will be using some of them as gifts on the 6th January, the Three Magic Kings. Hope you have a wonderful 2016!